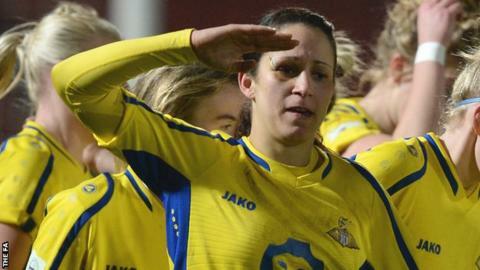 Courtney Sweetman-Kirk says the second-half hat-trick that inspired Doncaster to a dramatic 3-2 Continental Cup win over Everton was one of her finest moments in football. Everton were 2-0 up before striker Sweetman-Kirk came off the bench to pull a goal back with her first touch. She then levelled with a header before scrambling home the winner five minutes from the end. "It's probably one of the best nights I've had in football," she said. "I'm high on confidence at the minute so it's nice to get another three. It's always a fantastic feeling scoring goals. Scoring a hat-trick is brilliant and it being the winner is even better." Courtney Sweetman-Kirk's hat-trick denied Everton their first points in the Continental Cup this season. The Toffees and fellow WSL 2 side Durham are the only sides in Group Two still without a point. With less than 30 minutes remaining in the match, Doncaster Rovers Belles boss Glen Harris had sent on the club's leading scorer with a simple message. "Glen said to go on and get some goals - I don't think he envisioned three, I probably didn't either," said Sweetman-Kirk, who took her season tally to 17 goals from 16 games. "I'm not going to lie - the third goal was a bit of a mishit to be honest, so I was glad to see it trickle into the back of the net." The victory was Doncaster's first in the Continental Cup this season, with the WSL 2 pacesetters having previously lost 3-0 to top-tier sides Manchester City and Liverpool. Holders City and Liverpool lead the way in Group Two with 100% records in the competition.